Mark Pryor's farewell is everything that's wrong with politics. 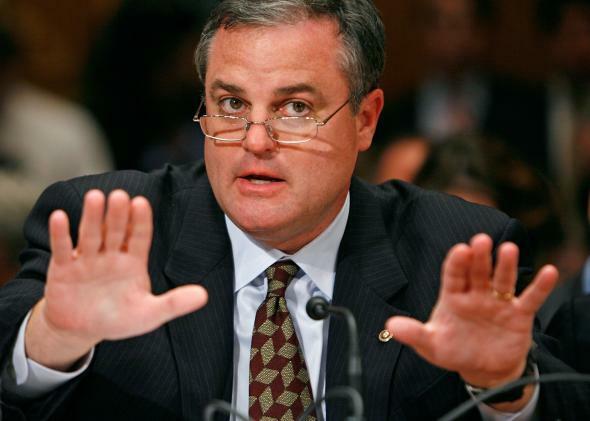 Mark Pryor, presumably making a less terrible speech. If you want to know why Sen. Mark Pryor got demolished in November, look no further than the farewell address he gave on Monday. It’s hard to believe—given that he didn’t even snag 40 percent of the vote—but Pryor should have had a much better shot at holding his Arkansas seat. The Democrat had a spiritual gift for retail politicking, his father was a popular governor of the state, and he’d been in local politics since he became a member of the Arkansas House of Representatives in 1991. He faced a young, awkward political neophyte who hadn’t even served a full term in the U.S. House of Representatives. In retrospect, Pryor’s 17-point loss seems a little nuts. But the senator’s final words to his upper chamber colleagues may give a bit of insight as to why he had trouble pitching himself to voters. Pryor kicked off his farewell address by thanking Arkansans, his family, his staff, and his colleagues. He was warm and gracious. But then things went south. “As great an institution as the Senate is, the Senate is broken, and the American people know it,” he said. At this, my ears perked up. Pryor had nothing to lose, right? He’s leaving the Senate after 12 years, which ought to be ample time to diagnose problems and think of possible solutions. What better opportunity than this to gently suggest to his colleagues that they look to improve their institution? It didn’t happen. Pryor briefly noted that he would support Republicans undoing the rules changes that Democrats made to the filibuster for certain nominees, and getting back to passing legislation under regular order with an open amendment process. He spent about 20 seconds discussing that, and it was the only concrete proposal of his speech. Then he said there’s too much hyperpartisanship in Washington, and that it’s hurting the economy because there have been “wild swings in regulations” since the Clinton administration. Can you imagine what Pryor’s solution to hyperpartisanship possibly might be? “Let’s take off the red jersey, and take off the blue jersey, and let us all put on the red, white, and blue jersey,” he said. This is not helpful advice; this is a terrible campaign trail platitude that basically everyone running for any office uses some version of. In those situations, it’s sort of understandable—you’re running for the House or the Senate, and you need soccer moms to vote for you, but you don’t want to upset your base, and you’re sleep-deprived and crabby, and your staff is pissed, so, OK, fine! You talk about how people need to wear red, white, and blue jerseys. It means nothing, but hey, it’s the campaign trail and everything means nothing. One would hope a Senate farewell address would be different from a campaign stump speech. One would hope even that might be just slightly less cliché. In Pryor’s case, one’s hopes would be misplaced. Pryor seems like a friendly, affable person. But considering this was how he chose to go out, it’s almost surprising he didn’t lose by more.